America is not just a building, a country, a person, or a religion. America is an ideal of freedom. We are united and we are coming! Rewards for Justice - The US is offering rewards up to 50 million dollars for wanted terrorists. This program was established by the 1984 Act to Combat International Terrorism. Under the Rewards Program, cooperating individuals and their immediate family members may be eligible for relocation to the United States or elsewhere, and they are assured complete confidentiality. Rewards, totaling millions of dollars, have been paid in dozens of cases. Innocent lives have been saved and terrorists put behind bars. Leonard Pitts editorial - The barbarians will learn what America's all about. A message for Osama bin Laden - The U.S.A. accepts your challenge. 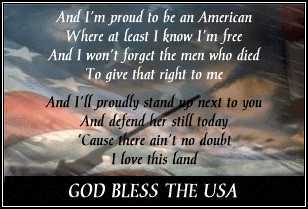 God Bless The USA - Lee Greenwood's song proclaims I'm Proud To Be An American! 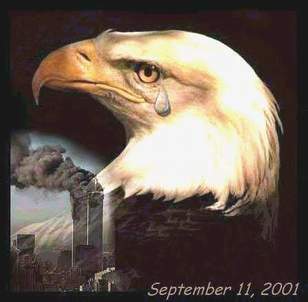 God Bless America - Kate Smith sings this very moving song about our country. Patriotic Songs - Lyrics and midi music. John Wayne talks about America - A collection of Wavs and MP3s. The Americans - Gordon Sinclair's sturring radio editorial praising the United States. Red Cross Donation Form - Help the Red Cross provide for the victims. Salvation Army - Help the Salvation Army's on-going relief efforts. Helping Children To Understand The Disaster - The American Academy of Pediatrics offers advice on how to communicate with children and adolescents during times of crisis. Hoax-Slayer - Dedicated to debunking email hoaxes, thwarting Internet scammers, combating spam, and educating web users about email and Internet security issues. Hoaxbusters Big List of Hoaxes - Interspersed among the junk mail and spam that fills our Internet e-mail boxes are dire warnings about Terrorist attacks, devastating new viruses, Trojans that eat the heart out of your system, and malicious software that can steal the computer right off your desk. Added to that are messages about free money, children in trouble, and other items designed to grab you and get you to forward the message to everyone you know. Most all of these messages are hoaxes or chain letters. Urban Legends Reference Pages - Check out e-mail or rumors that sound incredible. They're probably hoaxes. Urban Legends and Folklore - Virus Hoaxes, Terrorism Hoaxes, E-mail Hoaxes, Chain Letters, etc. Don't Spread That Hoax - If you get a message, or see a posting on Usenet that seems like it should be shared with LOTS of people, check here before forwarding it. Better Business Bureau - Shopping Safely Online. Computer Emergency Respose Team (CERT) - Home network security information for home users - an overview of the security risks and countermeasures associated with Internet connectivity, especially in the context of "always-on" broadband access services (such as cable modems and DSL). However, much of the content is also relevant to traditional dial-up users (users who connect to the Internet using a modem). How to Protect Yourself From Email Fraud - One of the biggest problems we face is that of email and Internet fraud. Basically email fraud is when an email is sent by someone who makes a false claim. The purpose of this type of email would be to con the recipient into acting in a way that can result in a loss of money. Email fraud is becoming one of the biggest problems that people currently face online. While laws are in place protecting people from becoming victims of the scam, the key is being aware of potential dangers and to avoid being a victim. Internet Crime Complaint Center (IC3) - A partnership between the Federal Bureau of Investigation (FBI) and the National White Collar Crime Center (NW3C) that serves as a vehicle to receive, develop, and refer criminal complaints regarding the rapidly expanding arena of cyber crime. The IC3 gives the victims of cyber crime a convenient and easy-to-use reporting mechanism that alerts authorities of suspected criminal or civil violations. For law enforcement and regulatory agencies at the federal, state, local and international level, IC3 provides a central referral mechanism for complaints involving Internet related crimes. OnGuardOnline.gov - Practical tips from the federal government and the technology industry to help you be on guard against Internet fraud, secure your computer, and protect your personal information. Privacy Rights Clearinghouse - A nonprofit consumer education, research, and advocacy program. Their publications empower you to take action to control your personal information by providing practical tips on privacy protection. StopBadware.org - There are several commonly recognized terms for specific kinds of Badware - Spyware, Malware, and deceptive Adware. Badware is malicious software that tracks your moves online and feeds that information back to shady marketing groups so that they can ambush you with targeted ads. If your every move online is checked by a pop-up ad, it's highly likely that you, like 59 million Americans, have Spyware or other malicious Badware on your computer. U.S. Department of Homeland Security - Seven Simple Computer Security Tips for Small Business and Home Computer Users. BenefitsCheckUp is a free, online service from the National Council on the Aging that helps older Americans identify state and federal assistance programs that can help improve their quality of life. This confidential service contains a simple, straightforward questionnaire that takes no longer than 15 minutes to complete. Within minutes, seniors can get a report detailing the many programs and services for which they may qualify.